Hello - Our well is drilled to 960 Ft. in 1990 into what is known as the Trinty sand. Very good water except for the rotten egg smell, especially in the hot water. In late 1990 I installed a Sears Bleach injector for the smell. It worked great. Over the years I bought one more new Sears injector for the well. Then three years ago lightning destroyed the submersible pump. After the well service people pulled the pump, from about 450 Ft. he recommended that we install a 1 HP Constant Pressure pump and lower the pump to 750 Ft. due to the continuing drought in our area. I agreed and the well was repaired. About 3 months later the water started to smell again as it did in 1990 and I contacted the well service rep and asked him to check the well system. He then told me that Injector was not compatible with the Constant Pressure pump. I was told I would have to find some other way to control the smell. The Injector could no longer be connected to start and stop with pump operation. I added a timer to the Injector and that worked just fine until last month when the Injector failed due to old age, I assume. I contacted Sears and they no longer offer the Injector. Can you suggest a replacement system? The current pump control box does not offer 120V service at the pressure switch. Would adding a flow switch be necessary? Water test show no problems, except hardness. Thanks for emailing. 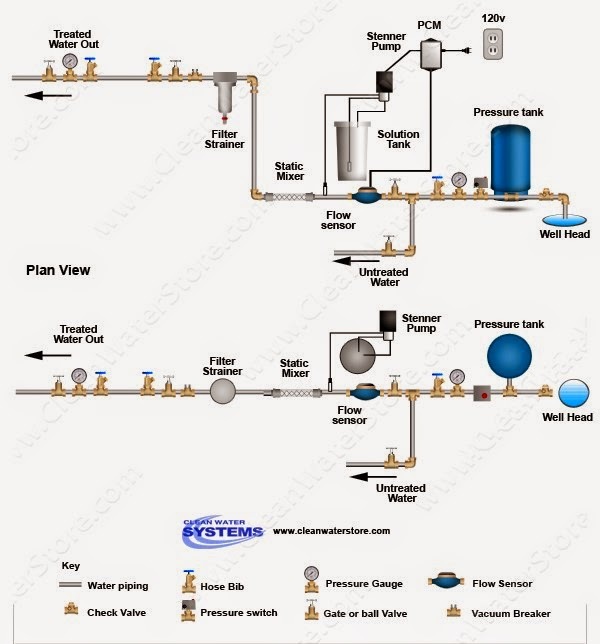 For a constant pressure system, a proportional feed chlorinator is needed, a flow switch would not work. With a flow switch, the chlorinator would turn on even if there were very little flow and so the chlorine dosage would not be correct. But we do have a proportional feed chlorinator that works very well and is easy to install and set up. It consists of a water meter with a pulse output cable attached to it, that allows the chlorinator pump (we like the Stenner pump, its easy to use and is self-priming) to turn on and off based on the flow of the water. See the diagram and items below. You might have a solution tank you can use already. In that case, all you would need is the Stenner pump, PCM control box and the water meter. The PCM control box plugs into a 120v wall outlet. 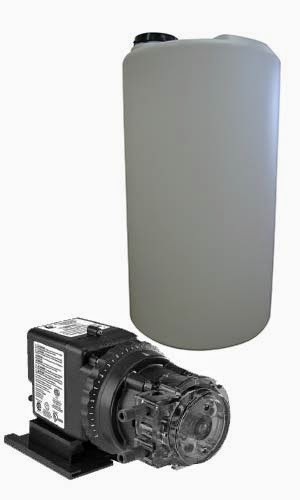 This Inline Static Mixer will instantaneously and completely mix any combination of gas or liquid with the water stream. The unique baffle design continues to redivide and recombine the streams as it passes through, generating a lot of turbulence, ensuring complete mixing with no energy, moving parts and very low pressure loss. We hope this information helps you solve your problems, if you have any further questions, or would like to update us on your progress - we love pictures and testimonials! - you can reach us at support@cleanwaterstore.com or on Facebook. Thanks for the letter!